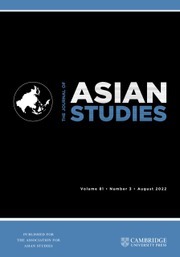 The Journal of Asian Studies (JAS) has played a defining role in the field of Asian studies for over 75 years. JAS publishes the very best empirical and multidisciplinary work on Asia, spanning the arts, history, literature, the social sciences, and cultural studies. Experts around the world turn to this quarterly journal for the latest in-depth scholarship on Asia's past and present, for its extensive book reviews, and for its state-of-the-field essays on established and emerging topics. With coverage reaching from South and Southeast Asia to China, Inner Asia, and Northeast Asia, JAS welcomes broad comparative and transnational studies as well as essays emanating from fine-grained historical, cultural, political, and literary research. The journal also publishes clusters of papers that present new and vibrant discussions on specific themes and issues. Memory, Reconciliation, and Reunions in South Korea: Crossing the Divide. By Nan Kim. Lanham, Md. : Lexington Books, 2015. xxvii, 255 pp. ISBN: 9780739184714 (cloth, also available in paper and as e-book). The Buddha Party: How the People's Republic of China Works to Define and Control Tibetan Buddhism. By John Powers. New York: Oxford University Press, 2017. xiv, 370 pp. ISBN: 9780199358151 (cloth, also available as e-book). The Skull of Alum Bheg: The Life and Death of a Rebel of 1857. By Kim A. Wagner. New York: Oxford University Press, 2018. xxix, 288 pp. ISBN: 978019087023 (cloth, also available as e-book). Silk, Slaves, and Stupas: Material Culture of the Silk Road. By Susan Whitfield. Oakland: University of California Press, 2018. xi, 339 pp. ISBN: 9780520281783 (paper, also available in cloth and as e-book). Runaway Wives, Urban Crimes, and Survival Tactics in Wartime Beijing, 1937–1949. By Zhao Ma. Cambridge, Mass. : Harvard University Asia Center, 2015. xiv, 366 pp. ISBN: 9780674088382 (cloth). Text and Tradition in South India. By Velcheru Narayana Rao. Albany: State University of New York Press, 2016. 494 pp. ISBN: 9788178244723 (cloth, also available in paper and as e-book).